One happy family: Dream Theater with their new drummer, Mike Mangini (second from right). And in the end, it's going to be Mike pounding the drums for progressive rock kings Dream Theater. No, Mike Portnoy isn't rejoining the band. After a grueling series of auditions, the group has picked Boston-based sticksman Mike Mangini as their new drummer. 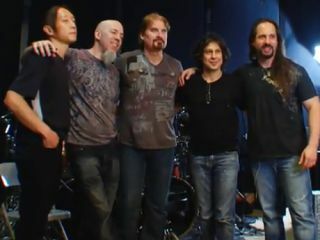 In the last webisode just released, Dream Theater audition the last two contenders, Aquiles Priester and Peter Wildoer. Wildoer proved to be a last-minute wild card - the band was clearly impressed with his skills. The choices were then narrowed down to Mangini, Marco Minnemann and Wildoer. And then it came down to the two MMs - Mangini and Minnemann. Finally, after much deliberation, singer James LaBrie placed a call to Mangini, who was waiting for the news with bated breath. Cell phone pressed to his ear, Mangini heard the words he had been longing to hear: "We have some news for you," LaBrie said," and we'd like to welcome you to the family." Mangini receives a life-changing phone call. "Wow, wow, wow!" Mangini exclaimed, overcome with emotion. "I have a tsunami of things going on in my head." Struggling to put his thoughts together, the drummer expressed his profound appreciation. The band is now deep into the recording process of their upcoming album with Mangini firmly on board. "We're very high on Mike," said guitarist John Petrucci while seated in the group's studio. He looked both pleased and relieved. "I feel really honored to be part of not only such a legendary band, but this band in particular," Mangini said days later, still walking on Cloud Nine. "What I'm feeling is such a sense of fulfillment and purpose. And with Mike [Portnoy] in particular, I feel honored to carry on the torch for him. I'm carrying on his spirit." You can watch the full video on the Roadrunner Records YouTube channel.